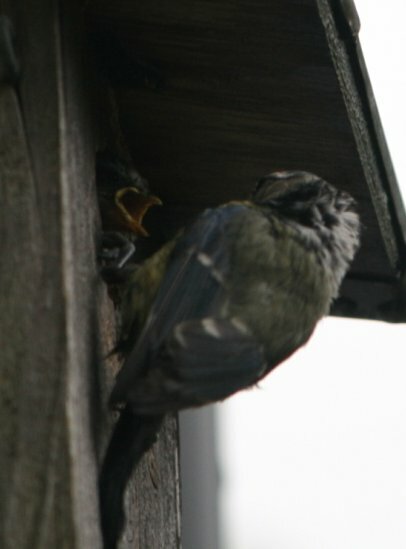 I have a birdbox on the side of my house with a camera in it. It's been there for a few years now, but this year, 2008, was the first time that I was able to see anything interesting. This page includes photos from inside and outside the box, and a few movies from inside. Here's the box. It's not the most twee of locations, being next to the bathroom pipes, but they don't seem to mind. It faces West. 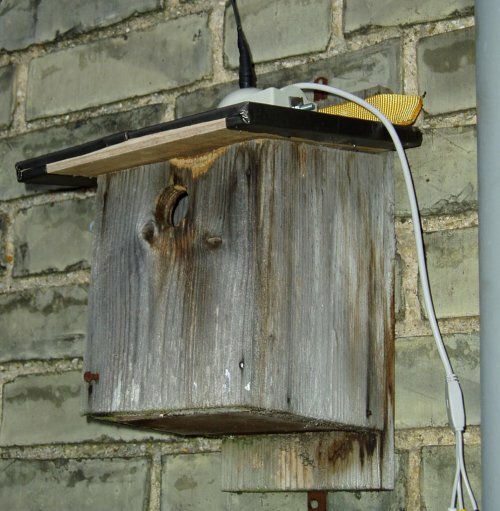 You can see the camera in the roof; an aerial sticking up sends the video to a receiver inside the house, while the wires to the right supply power. 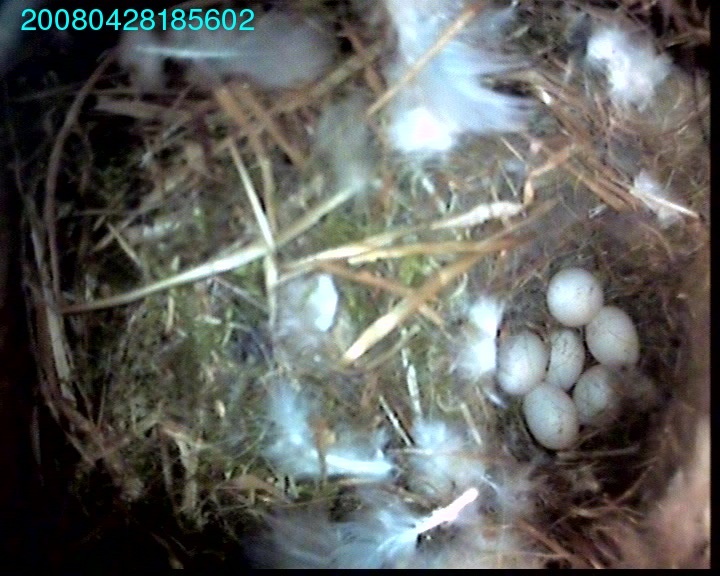 Last year I didn't record any inside footage, but I did see one chick (the only one?) 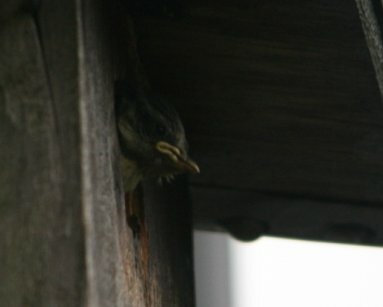 fledge. Here it is with both parents (29th May 2007). One of the parents is trying to offer a small green caterpillar. They chose a rather wet day for it. 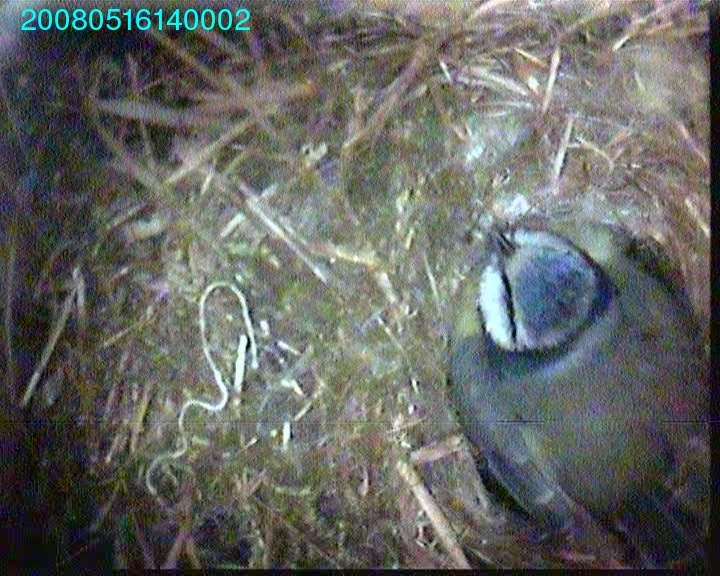 Over the next few days they spent quite a lot of time buried in nest material, perhaps to keep them warm. 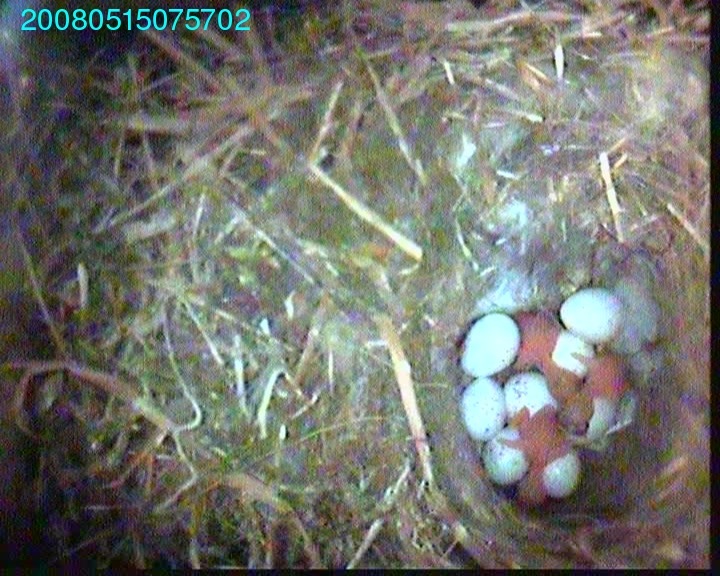 Eventually on 8th May all 11 could be seen - though I'm not sure when the last one was laid. 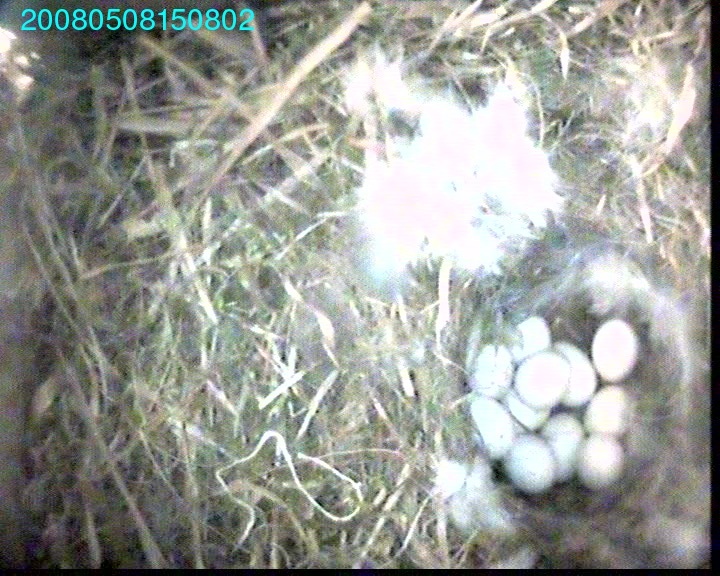 Here is a film of the chicks when they were very tiny (12 MB) on 15th May: some of the eggs haven't hatched yet, and the hatched chicks are pretty helpless. Mum doesn't seem very sure what to do with them, except sit on them, which she does. 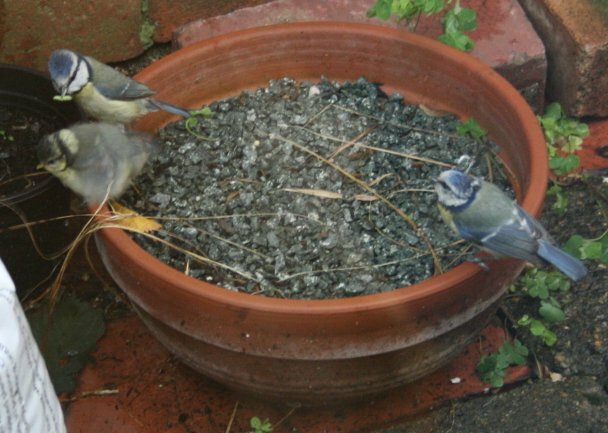 Later the same day I recorded what may have been this chick's first worm (10 MB): Mr Bluetit brings in some tiny snack and passes it to Mrs, who feeds it to one of the lucky babies. 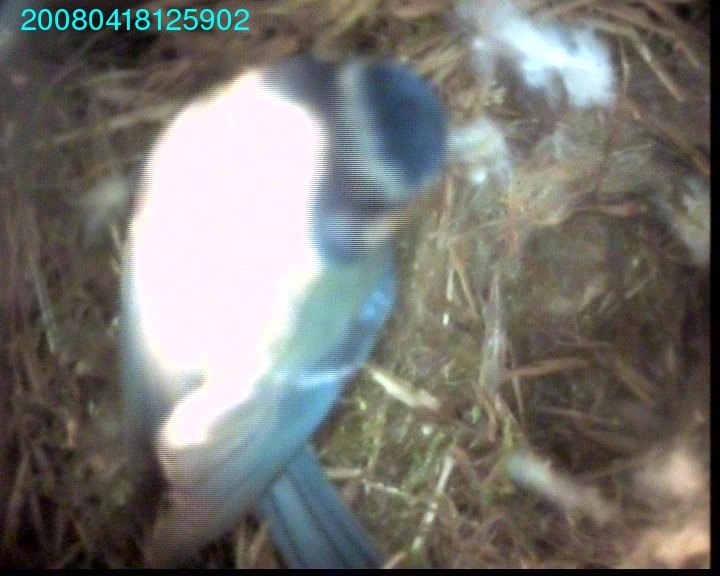 The trauma of the giant caterpillar (19th May): in part 1 (10 MB), Mr. Bluetit has brought a caterpillar that is too big for the tiny chicks to eat (though they have a go). He eventually retrieves it and flies off with it. A while later, in part 2 (48 MB) he comes back with the same caterpillar and the two parents briefly try to pull it apart, but a huge chunk of it is shoved down the throat of one of the babies which has no chance of swallowing it. So he picks it up again and decides to fly off - with the chick still dangling from the end of the caterpillar! Watch the videos to find out how it ends. 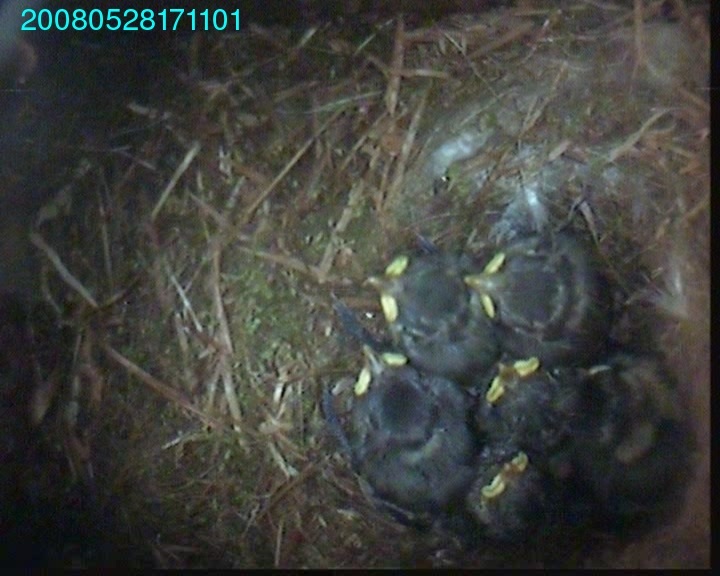 Here they are five days after the first ones hatched (20th May). 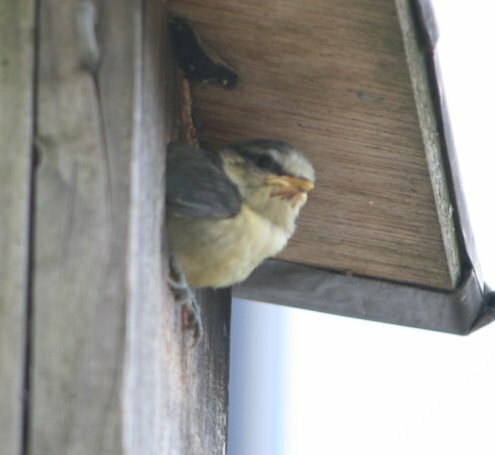 Most of them have now got a dark line down their back and dark patches on their wings where the feathers will sprout from. 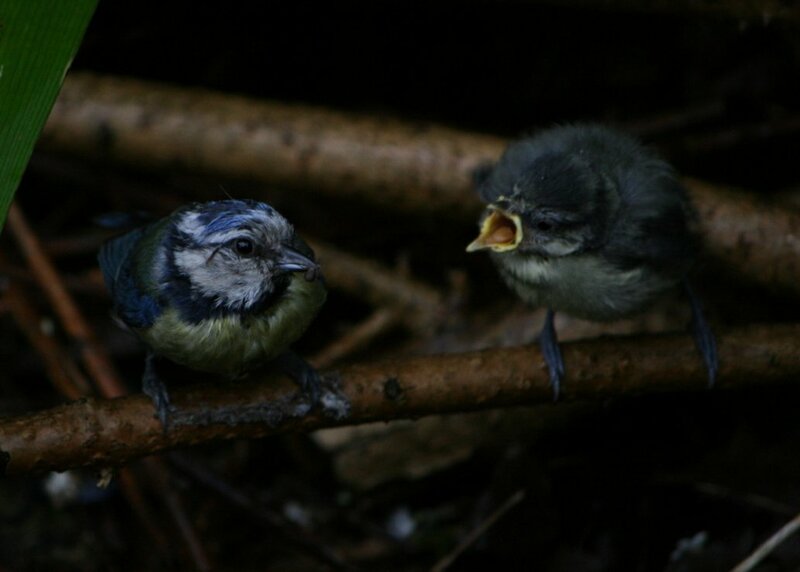 Fussy eaters (9 MB): these chicks can be a bit fussy sometimes. 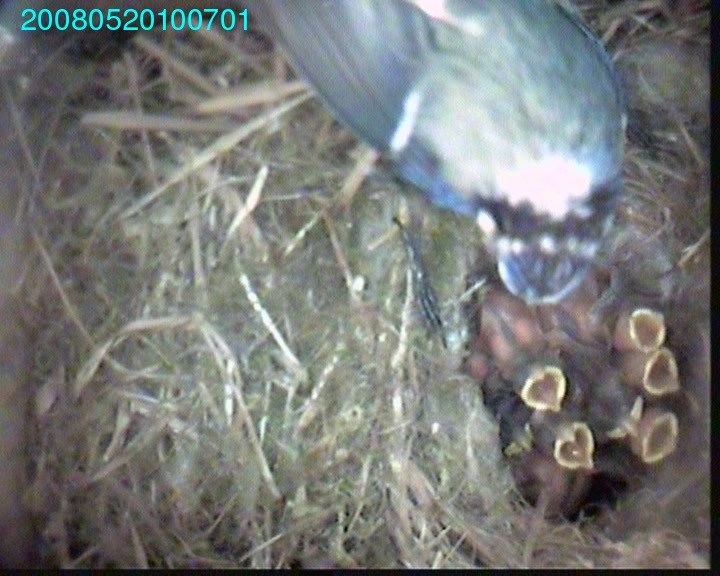 Here the parent offers a tasty nibble to three different wide-open beaks no less than seven times, but none of them want to swallow it. 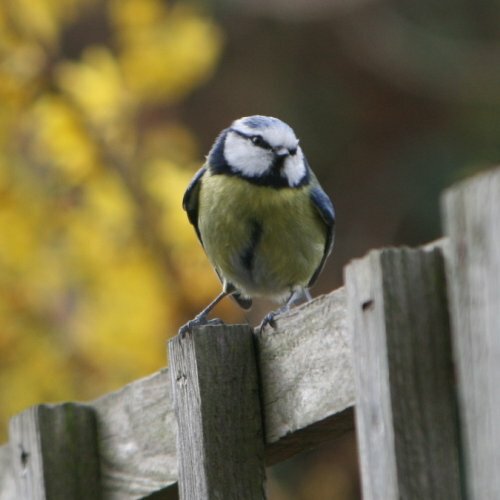 She ends up eating it herself, collects a poo parcel, and flies off. 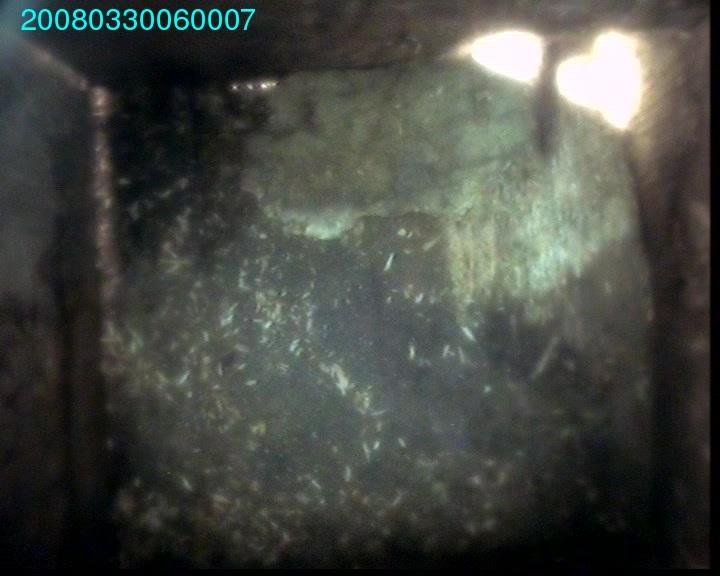 Here's a less traumatic episode (19 MB) from 24th May: a couple of the older chicks decide to explore the corners of the box. Although they're still blind (as far as I can tell), I think they may be drawn to the light from the cracks in the corners of the box; it was a bright day. They're a lot less active when it's dark and cold. 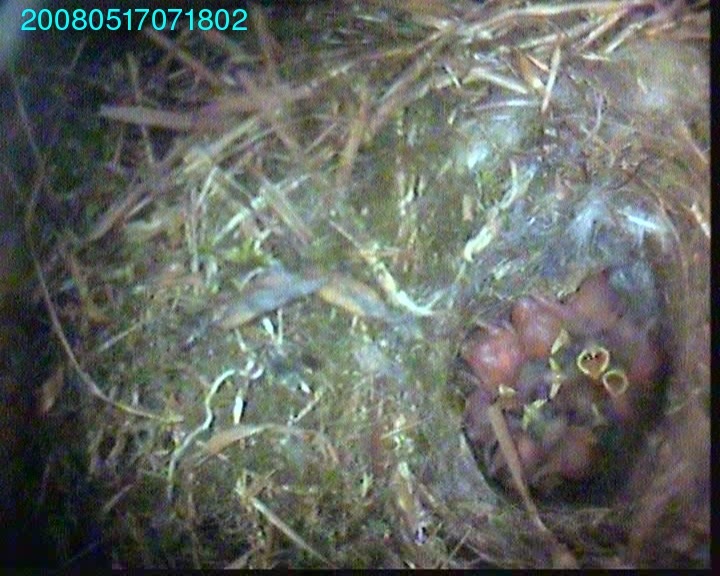 Here's the first time they looked out of the hole (14 MB) (27th May): the chicks have opened their eyes at last and three of them seem to want to look out of the hole. From the camera angle I can't tell if they can really reach it, but they're certainly contemplating the outside world and flapping their wings a bit. Sorry about the poor quality in this one. 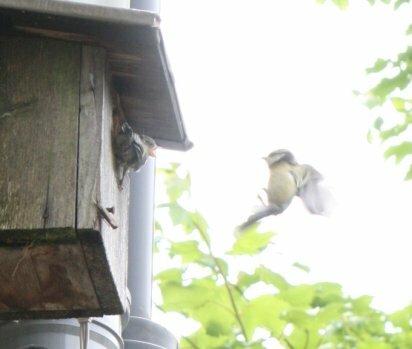 Here's some more confused eating (23 MB) (30th May): both parents are in the box offering food to the chicks. The one on the left has something that looks like it may be a spider; it seems to have legs. This is offered to various chicks but they don't seem interested and (s)he repeatedly leaves the box and comes straight back to offer it to them again; this is something that they seem to do frequently. 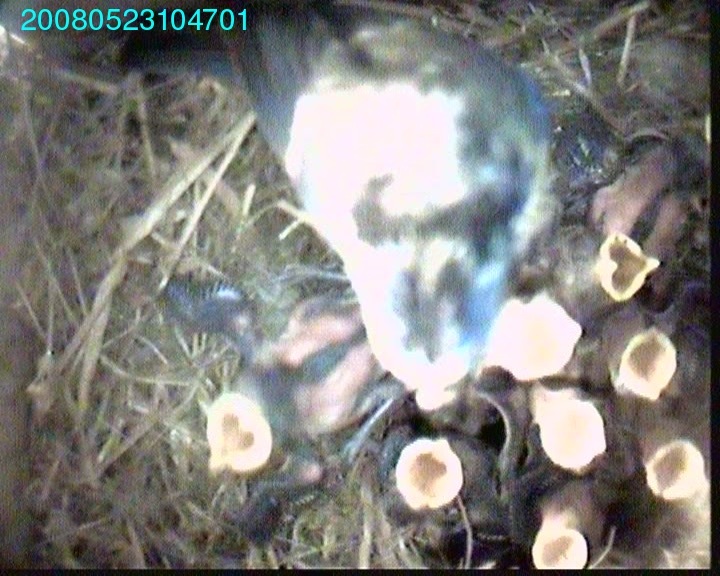 The other parent, on the right, must have something more tasty as this ritual isn't necessary, but it seems too big for the first chick to manage. The second one gulps it down. It was a rather wet day and he didn't look very happy. 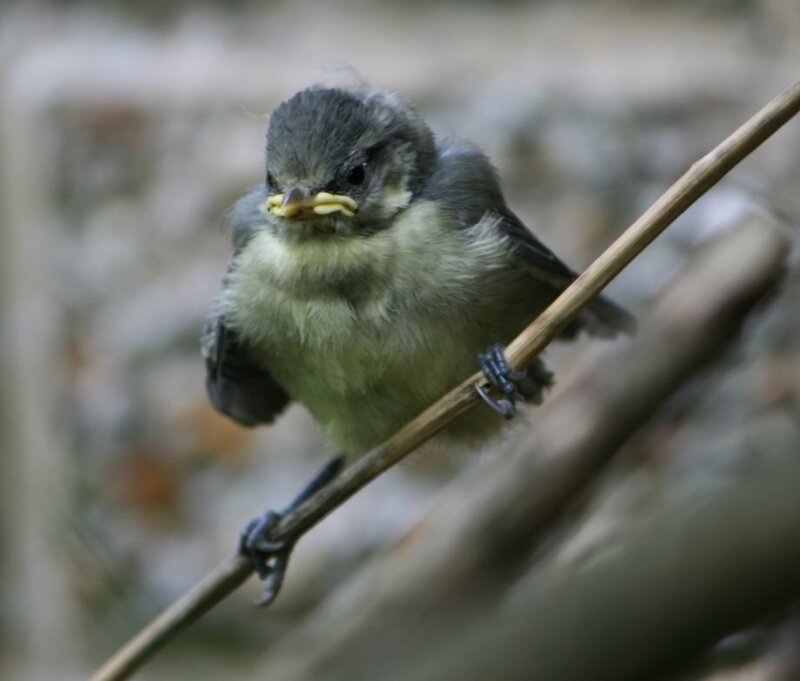 Eventually he wandered off down the garden - on foot - and took up residence on this stick, where the parents started to feed him. Although I saw some of the other chicks looking out of the box, none of them left it that day which was sensible considering the rain that their brother was having to put up with. The following morning was much sunnier though and they all eventually took the plunge. This is him, a few seconds later, on the way down. Sorry about the quality on these two. Now there was just one left. She (genders attributed randomly!) 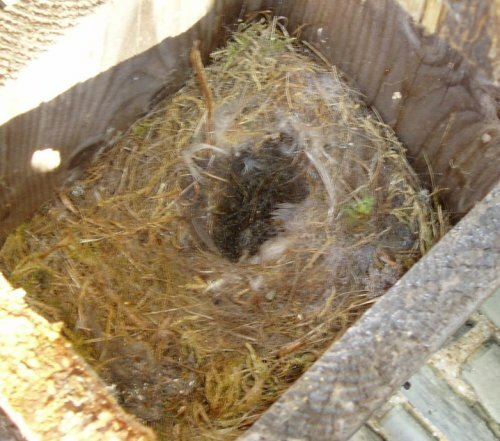 spent a few more hours in the box, where she was still being fed by the parents but only had two dead siblings and some flies for company. 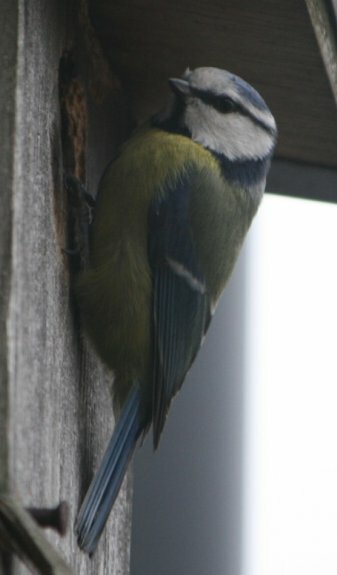 Eventually she spent about ten minutes poised in the hole like this, and eventually flew off at 1438. 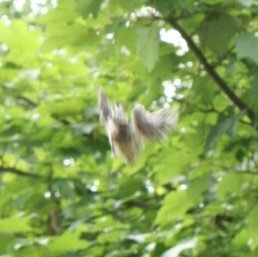 And she really flew, just like the parents do, on a horizontal trajectory around the back of the house. Down at ground level, number three had found a stick to climb up. 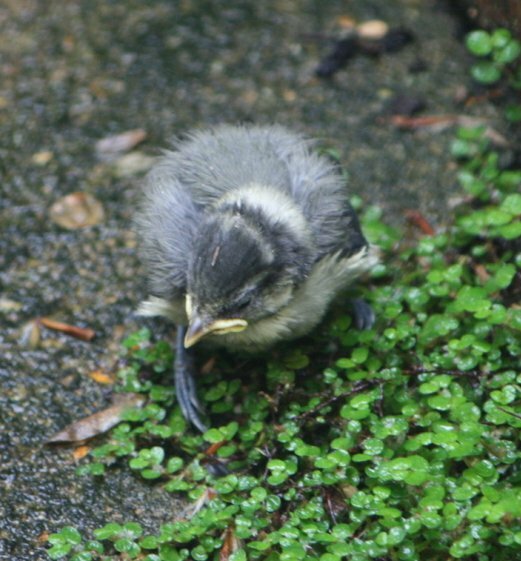 The parents were still feeding one chick on the ground the following afternoon; I'm not sure if it was number one or number three. It's impossible to know how the others were doing as you really can't see them once they're in the trees. I've assembled a time-lapse movie for the whole period (26 MB) (or a smaller version (7 MB)): it's one frame per hour until the start of May, then one frame every 20 minutes. The movie files are rather large and may take a while to download if you have a slow internet connection. The movies are encoded in mpeg4 format, served over HTTP. It's possible that you will need to install some extra software to view them, but I'm afraid I can't offer any advice about that except to say that perhaps Quicktime will play them and mplayer certainly will. Failing that, maybe google can tell you what you need. If you can't see one of the movies, please don't waste time trying to view the others as they're all in the same format. Some of the movies are rather poor quality, due to numerous factors including interference on the radio link from the birdbox, condensation in the camera, focus, the timeswitch on the camera being wrong, not having enough buffer memory on the receiver, the camera getting too hot and so on. Some days' movies are entirely missing as something always seems to crash when I go away. C'est la vie. Hopefully the newer movies are better than the older ones: now that I know that they're worth watching (touch wood), I'll pay some more attention to keeping it working properly. Perhaps because of the temperature, the images are generally better in the morning than the afternoon.